The USDCHF has been toying with its 200 day MA over the last 4 trading days. Each day, the price has traded above and below the longer MA, suggesting the market is just not sure, what the next move will be (higher or lower). What keeps the bias a little more bearish at this area, is that the price swing highs going back to March 12th, have all found sellers ahead of the falling 100 hour MA (blue line in the chart below). Friday, the price went right up to the line. Today, the market price sniffed the line and fell off. 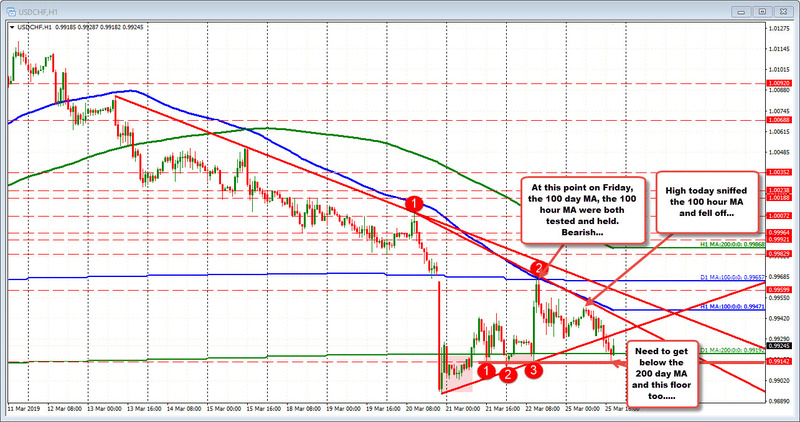 Also hurting the bias is the price is below trend lines - one a downward sloping line. Another line is an upward sloping line. Bearish. If the pair is to go lower, the 200 day MA has to be breached and stay breached. Buyers may lean against that level until that move is made. On the topside, the 100 hour MA is a step in the bullish direction if it is breached.